The number of applicants to University of Copenhagen Bachelor’s programmes fell slightly this year. Applicants, meanwhile, continue to seek admission to programmes most likely to result in jobs. Nationally, 28% of all applicants list the University as their first choice. The University of Copenhagen received 25,995 applications from a total of 17,238 individual applicants this year. Applications are down 1.8% compared with 2014, but the number is still far more than the University can accept. Some 11,771 applicants, or seven out of every ten, listed the University of Copenhagen as their first priority, making it the most popular university in the country. The number applicants to individual programmes varied considerably. While applications to the Faculty of Social Sciences rose 5.9% and applications to the Faculty of Law rose slightly, other faculties received fewer applications. “With the exception of Rhetoric, whose 157% increase in the number of applicants was the largest this year, the number of people applying to humanities programmes fell significantly. In general, applicants are interested in getting into programmes that will result in a job after they complete their studies, and the media’s focus on high unemployment rates for recent graduates from humanities programmes in particular has probably influenced applicants,” says Pernille Kindtler, the area manager for Guidance and Admissions. The large increase in the number of applicants to the Rhetoric programme is due to a decision in 2014 to increase the number of applicants, which resulted in a lower minimum GPA requirement. The lower admission requirement has most likely led many applicants to try to get in. “Today’s applicants say they are mostly interested in getting started as soon as possible. They are also realistic about their choice of programme. The don’t want to waste their time applying to programmes they won’t get into, so they do their homework before applying,” Kindtler says. While humanities programmes will be accepting fewer applicants this year, other programmes, including those in the social sciences and some in the natural sciences, will be accepting more. Applicants have been cognizant of the effects dimensioning will have, and they have paid attention to the discussions the decision to reduce admission led to. One of the things that applicants contacted guidance counsellors about most was the effect dimensioning would have on GPA requirements, some of which are already quite high. “This year’s applicants are well-informed. It could very well end up that the changes in the numbers of applicants we saw to individual programmes this year coincides with the changes we made to the number of applicants the programmes could accept,” Kindtler says. Since 2013, the University of Copenhagen has only accepted applications online. Applicants have been able to track their application and receive information from the University via the MitKU website. Starting this year, all correspondence with applicants will be sent either via MitKU or by e-mail. Eventually, the University will go over to sending all correspondence to applicants via MitKU. Doing so will leave students with two options, Optagelse.dk and MitKU, for submitting applications. Acceptance notifications will be sent via MitKU at midnight on 30 July. Applicants will be able to accept or reject their offer of admission immediately. GPA requirements will be published at the same time as acceptance notifications are sent. Programmes that are still open for admission will begin accepting new applications starting on 30 July. 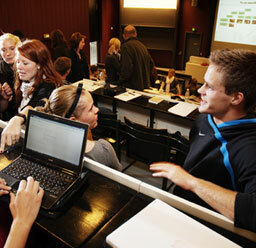 Programmes with openings will be posted on KOT.dk and studier.ku.dk.